In September, long-time Beerocrats Charlie and MaryLou Carrington volunteered to host one of the club’s social meetings at their home, as they had several times before. This time, we asked them if they would like to brew a demonstration beer for the club members, using ingredients donated by The Beverage People. They graciously agreed. Next, I asked Byron if he thought we might be able to get two different beers from a single boil kettle. 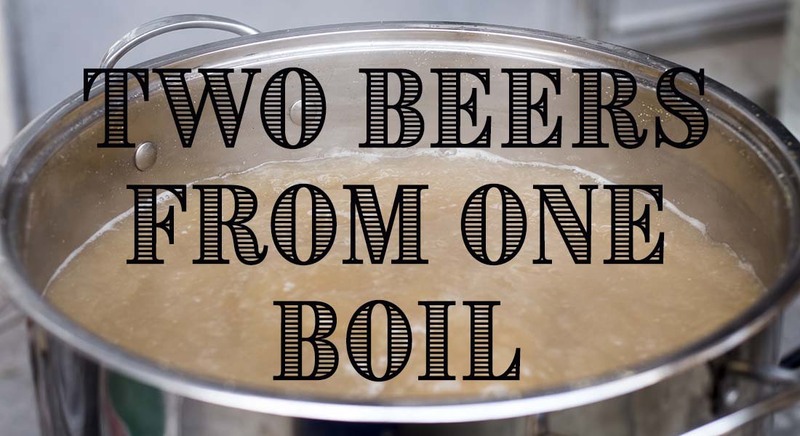 Now, it is not uncommon to make two beers from the same mash—but with two different boils. That technique is known as “partigyle” brewing and is usually used to make something like a barley wine from the first, strong runnings from the mash and a small beer or mild ale from the weaker, second runnings. However, we wanted two beers that would fully qualify as distinct under the 2004 style guidelines of the Beer Judge Certification Program—www.BJCP.org—from the combined runnings all boiled together. How to do it? Yeast choice or dry hopping are the logical places to look. Except for the much higher hop presence in the stout, they also have quite similar descriptions for flavor and aroma profiles. So, with these characteristics in mind, Byron created recipes for “St. Petersburg Special” Baltic Porter and “Sword of the Prophet” Russian Imperial Stout (see recipes, below). With the same grain bill and boil, they have the same Original Gravity, calculated at 1.095 (it actually came in at 1.088 on brewing day). All of the hops in the boil are the same, too, yielding an initial IBU calculation of 38.10. The porter stays there, but the stout gets 6 1/2 ounces of dry hops (in five gallons!) to bump the calculated bitterness to a much more Imperial 89.48. MaryLou did the lion’s share of the brewing as Beerocrats looked on, helped, and shared homebrew with one another. The big mash kettle got a thorough workout, boiling went smoothly, and the chilled wort was drained into two seven gallon carboys. The Carrington’s fermented the porter through to the finish and kegged it. I took the wort home for the stout, fermented it, and transferred the finished beer to a five-gallon Cornelius keg for the dry hopping. Using three hop socks, I stuffed in the generous dose, flushed the keg with CO2, and left it in the wine cellar at 55° for five weeks. After that, it was just priming sugar and the bottling bucket. With that high alcohol level, it took about three weeks to carbonate at about 70°. After tasting “Sword of the Prophet” a few times, we were finally able to bring it side-by-side with “St. Petersburg Special” at the beer-and-cheese event. Both beers turned out to be wonderful collaborations. The Baltic Porter is rich, creamy, and smooth, with sturdy but subdued hop support. With just as much richness, but with hops giving it a sharper edge, the Imperial Stout has a big hop aroma, full malt body, and long hoppy finish. Which was better with chocolate? The beer-and-cheese crowd said stout (see related article), but you can find out for yourself. Just buy a box of Trader Joe’s chocolate truffles and give these recipes a try! You can make either one alone as a five-gallon all-grain recipe or do what the Beerocrats did—make two beers from one boil!